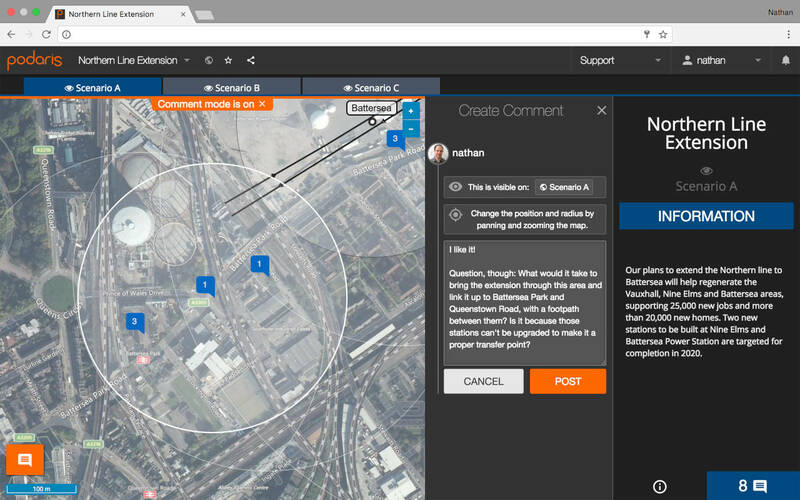 Engage provides a presentational window into your project’s views and a means to engage stakeholders in conversation through pinned comments. These views offer a way to compare scenarios at a glance, and present richly formatted information alongside your maps. ‘Unlisted’ projects are accessible to external stakeholders via a unique link, while more sensitive projects can be restricted to invited collaborators only. Engage reduces the risk of costly redesign work resulting from inefficient communication in the planning stages of a project, and facilitates immediate feedback from everyone involved.